Click here to RSVP or become a sponsor today. 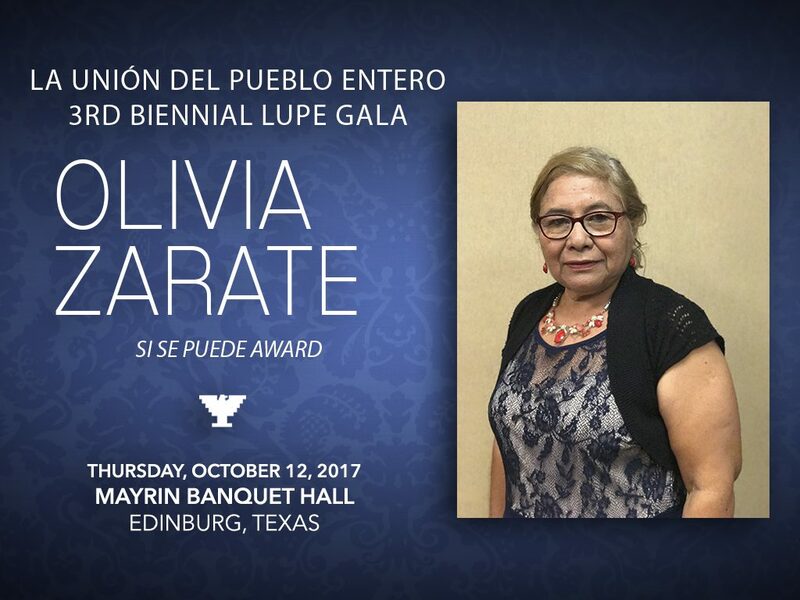 La Unión del Pueblo Entero presents: Olivia Zarate! which was needed for many reasons. Olivia and her colonia are now an example to others as to what can be done if you work hard and don’t give up. Wanting to do more for her community, Olivia joined LUPE’s Health on Wheels program as a Community Health Educator. Since becoming a Community Health Educator, Olivia has gained knowledge of the many resources out there and has been able to take part in getting uninsured low income families access to healthcare. Olivia also went through a promotora certification course to gain more knowledge on health and how to help her community. She can now direct people in the right path to services they need. La Unión del Pueblo Entero presents: Maria Romero! 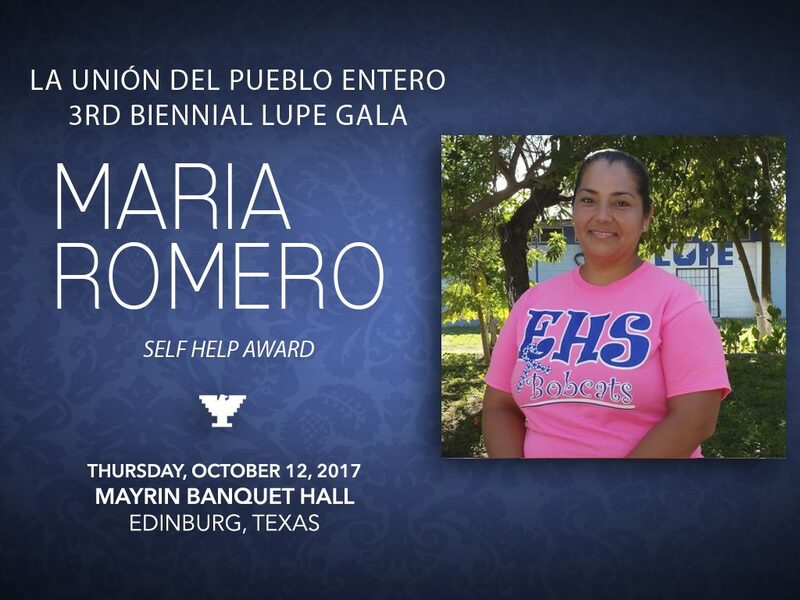 Maria Romero has been a LUPE member for 12 years. She began volunteering and helping with organizing efforts in her colonia Iowa Garden #3. In order to make her voice and that of her neighbors heard, she is often at the Hidalgo County Commission Meetings where she exposes the issues her colonia faces and suggests to elected officials ways to help fix the infrastructure disadvantages in her neighborhood. Maria volunteers her time with various community organizations, including the San Carlos Community Center, where has played an integral part in the youth summer program, food pantry and clothing donations for over 8 years. Her passion for education and literacy has driven her to participate in Unidos Por RGV, a coalition of community leaders that focuses on assuring that the needs of low income residents are represented in the development of the new university. Maria is also the host of a free neighborhood library project where children can take a book and return a book. Maria is currently part of the LUPE advisory board where she continuously and tirelessly helps in organizing the annual Cesar Chavez march, LUPE general meetings, and helps develop community actions and strategies. Most recently, Maria has joined LUPE’s Health on Wheels program, volunteering as a Community Health Worker. In this program, she plays a major role on health promotion and increasing health care access to uninsured and low-income families. Maria is a great example of leadership in action. Her selfless spirit for community service makes her a devoted volunteer and a strong advocate in her community.